Tune in tonight on Truth Finders Network at 10pm central as Don Rutledge interviews Dan Boggs, president of GARDAP, about the issues facing the residents of Gardendale specifically 78 year old widow, Jeannie Owens. Please listen, please help all that you can. 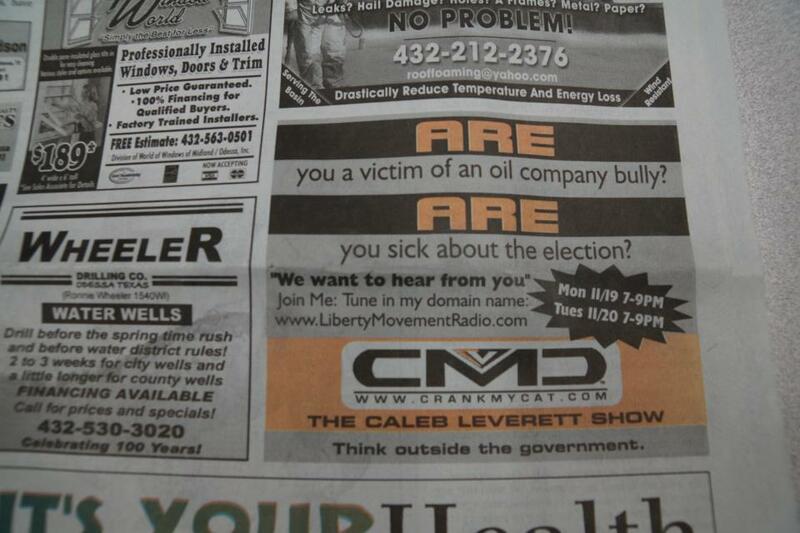 Or tune into Adam vs the Man with Adam Kokesh as he interviews Gardendale champion, Caleb Leverett, also at 10pm. They can’t “not know” anymore! Texas elected representatives! Feigned ignorance of the injustices and environmental crimes of the rampaging oil and gas companies will no longer work! Bring sanity to exploration and production now! Go to TxSharon blog to link to a Bloomberg news story about the failure of FracFocus.org. Go to Earthworks website and read the study, “Breaking all the rules…”. It is a study based on publicly released documents highlighting the failures of state agencies in making sure oil and gas companies follow the existing guidelines. Act to protect the civil rights of landowners! In the words of Calvin Tillman,”once you know you can’t not know.” You now know what they are doing to surface owners. You now know they are burying pits…filled with toxic waste mere feet above our water table. You now know our air has such a stench it makes one nauseous to breathe in and causes headaches and nosebleeds. (Come to Gardendale) You now know that unrestrained development strains city and county resources to the breaking point! You now know that their right to use our land as they see fit without just compensation destroys our private use of it ! You can’t not know anymore! Cowboy up and do the right thing. Protect your constituents from the ravages of oil and gas companies bent on destroying our use of our own property. “I didn’t know” or, ” The TCEQ and RRC takes care of that” won’t work any more.You now know the state agencies responsible for regulating oil and gas and protecting our land, air and water are Impotent by Design! Dan Boggs, President, West Texas Accountability Project. Common Issues, Uncommon Courage: Listen Tonight! West Texas Accountability Project is born! Gardap is changing its name. It is now the West Texas Accountability Project, Gardendale Chapter. We changed the name in response to a new chapter. Lubbock has joined. West Texas Accountability Project, Lubbock Chapter is their name. Armando Gonzales is their president. You will be seeing and hearing more from them soon! Welcome Lubbock! t to our home are disgusted and angry, but when a working guy says, “enough”, that’s a real breakthrough. Devon on the other hand, is more or less, a scumbag company; proof is this video. Devon has rights? Is that what the Devon chickensh*t said? What about that family that lives there? They don’t have a right to live in peace? This kind of bullying is what will bring the oil field to its end. Sadly, there is a better way, but oil companies refuse to listen; too busy counting their money. “Impotent by Design” is the label GARDAP has placed on the TRRC, and the TCEQ. Slow reaction, and apathetic response characterize our exchanges with these agencies. Contempt for this industry is growing. No longer is the narrative, “that’s how we make our living” going to excuse their heinous behavior! This video was shot with a FLIR Gasfinder Camera, that is designed to detect VOCs, So what you are seeing is not steam, but is chemicals. This is a produced water tank that is located at a Chesapeake Energy natural gas compressor station along the Trinity River near downtown Fort Worth, TX.